Bargaining at CSN reached impasse as CSN continued its refusal to bargain over salary in violation of labor law. The process now moves to fact-finding. For more info see the following article. 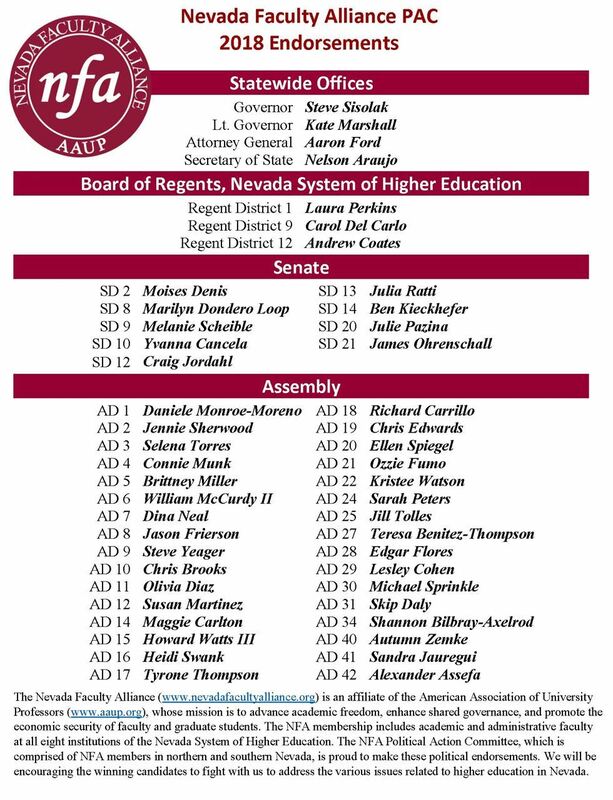 On June 8th, the Nevada Faculty Alliance imposed a deadline for the College of Southern Nevada to make significant progress towards agreement on matters related to compensation, by midnight June 30. These compensation-related items include lab pay, overload pay, and pay equity (compression adjustments which have historically been funded at the institutional level. It's the opinion of our lawyers at the NFA’s national affiliate the American Association of University Professors (AAUP) that the failure to make any tangible counter-offer on these topics constitute “bad faith” surface bargaining, an Unfair Labor Practice. During the same time period, the NFA will decide whether to file an unfair labor practice in District Court, or to declare an Impasse and refer the matter to a Fact-finder as provided in Nevada System of Higher Education code, should there be no agreement or significant enough progress. The college claims it has no money to make any agreement, which NFA disputes. They have also falsely alleged to the Chancellor and Legislators that NFA has asked for merit pay and/or Cost of living allowances funded by the legislature which is also untrue. NFA hopes that the imposition of a deadline will make the college take the compensation issues more seriously, since there’s been no progress even after 19 months. Should they not, having done our research, we expect success whether through the Courts or Fact-finding. A summary of the Public Employees’ Benefits Program Board actions from the November board meeting is available on the PEBP website. The Board accepted most all of Executive Officer Damon Haycock's recommendations for plan year 2019 changes, effective July 1, 2018. That includes (1) replacing the northern HMO with an Exclusive Provider Organization (EPO) with similar features and using over $10M of excess reserves generated by the High Deductible Health Plan (HDHP) to cover the associated increased risks for self-funding the EPO; and (2) not approving a $1 or $2/month per year of service additional employer contribution to the HRA (Health Reimbursement Account) for retirees on the Medicare Exchange. These two items were linked in the staff recommendation to the board because the extra reserves allocated for the EPO did not leave enough funds for increasing the HRA contribution for Medicare retirees. Also, the board expanded PEBP's subrogation powers via regulation (although with coverage of the participant's out-of-pocket costs from any recovery). Several minor enhancements to the HDHP were approved as outlined in the summary. Additional requirements were added for “earning” the supplemental $200/year HSA/HRA contribution for HDHP participants. Other proposed HDHP plan benefits or increased HSA/HRA contributions were rejected, also because of potential costs of the EPO. NFA’s positions on these issues are available in our public comments to the PEBP Board posted at http://www.nevadafacultyalliance.org/LatestNews. In particular, NFA spoke against using excess reserves generated by the HDHP program and participants to establish the new EPO plan. The NFA appreciates the efforts of PEBP to protect program interests via subrogation efforts when a third party may be responsible for medical expenses incurred by PEBP. We also strongly agree with the part of the regulation that says the out-of-pocket medical costs for the participant should be covered first and in whole from any recovery. We are however concerned that the subrogation actions by the lawyers hired by Healthscope can at times be overly aggressive, particularly when the party being pursued is the participant or a close relative or their own insurance companies. When a participant buys homeowners or automotive liability insurance, they are doing it to protect themselves, not to protect PEBP or to lower PEBP premiums for others. The examples provided in the Board packet sound innocuous—involving traffic accidents with an unrelated third party at fault. However, the proposed regulations allow subrogation actions against, say, the grandmother of a PEBP participant’s covered child when a simple accident (neither intentional nor negligent) occurred in her home. Should PEBP and by extension the State as employer really be pursuing such a case? It is questionable whether the applicable statute actually was intended to apply to first party coverage, since it refers to legal liability rather than contractual liability created by purchase of an insurance policy. We recommend that the Board restrict the subrogation efforts to third party coverages only. A minimum alternative would be to create a policy to evaluate the merit of cases against participants or their close relatives. The decision to pursue a subrogation case should not be primarily based on money potential by Healthscope’s “vendors”—their hired lawyers—as it is described on page 12 of the Health Claims Auditors report (agenda item 4.3). The Nevada Faculty Alliance (NFA) is the statewide association of faculty at all eight NSHE institutions, most of whom participate in the Public Employees’ Benefits Program along with other state employees. The NFA greatly appreciates the hard work of the PEBP staff and the PEBP Board to maintain our health insurance program in the face of rising costs and budgetary constraints. It is a difficult task to balance diverse interests in a program with many moving targets. Regarding the HMO options (agenda item 10), we recommend caution. Although we understand that the HMO option is in distress due to rapidly rising costs, it is difficult to evaluate the proposed self-funded Exclusive Provider Organization (EPO) alternative because neither estimates of the rates nor the methodology to set the rates have been provided. The Board should ask for a better understanding before proceeding. We are also concerned about the rushed implementation of an entirely new program. Our biggest reservation is that the higher risks requiring a $10M to $15M increase in the Catastrophic Reserves are proposed to be absorbed by Excess Reserves from the CDHP program. Those Excess Reserves were created on the shoulders of CDHP participants and, arguably, retirees who were moved along with their higher risk pool to the Medicare Exchange. The Excess Reserves from the CDHP should not be used to fund the Catastrophic Reserves for a new EPO plan. Instead, if an EPO is implemented, it should be priced to fund its own share of the Catastrophic Reserves over an appropriate phase-in period of several years. To reduce the rate impact, the confidence level for the EPO catastrophic reserves could be phased in, reaching the desirable 95% level after a few years. That is what would necessarily happen with a completely new self-funded program, or if there were no excess reserves in another program. The existing Catastrophic Reserve does provide a buffer in case of poor EPO experience during the phase-in period.